Graphics Plus has provided print based marketing support to organizations for over 50 years. With the transition to digital marketing platforms, marketers need to be educated on the benefits of print in generating greater returns. In fact when digital and print mediums are used together in marketing the rate of return increases. The first challenge was creating a printed piece that encompassed several of the benefits of print. The second challenge was creating a direct mailer that stood out from the typical glossy card people receive in the mail. We decided on creating an emoji mailer as most people use them in their daily communications. 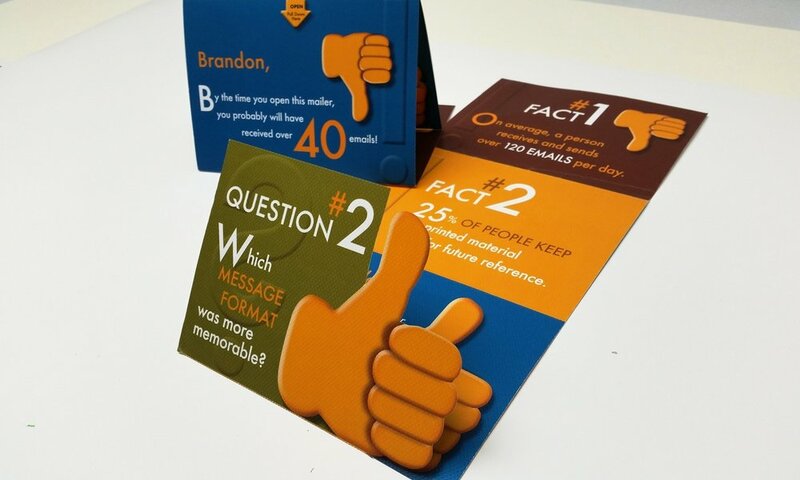 Since print appeals to multiple senses we used a textured stock, added a personalized message for each recipient, and incorporated a die cut "Thumbs Up" emoji which could be removed and used when communicating with others. We used the "Thumbs Up" emoji to accentuate the benefits of print, and the "Thumbs Down" emoji to highlight issues with digital marketing. Our goal was to educate marketers that print communications do not need to be in a rectangular format all the time, and would be memorable. Just as importantly, it was created in a cost effective format. This was the first in a series of 3 mailers, with the second scheduled for early February. Connect with us if you would like to be on our mailing list. Graphics Plus designed and produced the following elements for this direct mail project.